ZoomText Fusion is the ultimate accessibility tool for individuals with any level of vision impairment. ZoomText Fusion provides the best of both worlds – ZoomText, with is screen magnification and visual enhancements for screen viewing ease, coupled with the power and speed of JAWS for screen reading functionality. 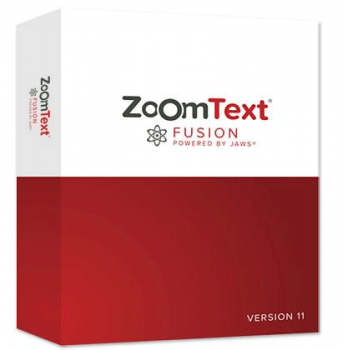 ZoomText Fusion Home Edition - (Non-Commercial Use Only) can be used with all 32-bit or 64-bit versions of Windows® 10, Windows 8.1, and Windows 7 along with Windows Server 2008, 2012, and 2016. ZoomText Fusion Professional can be used with all 32-bit or 64-bit versions of Windows® 10, Windows 8.1, and Windows 7 along with Windows Server 2008, 2012, and 2016. Add our Sotware Maintenance Agreement (SMA) to your purchase and receive our industry leading priority technical support and two future upgrades delivered to you automatically.